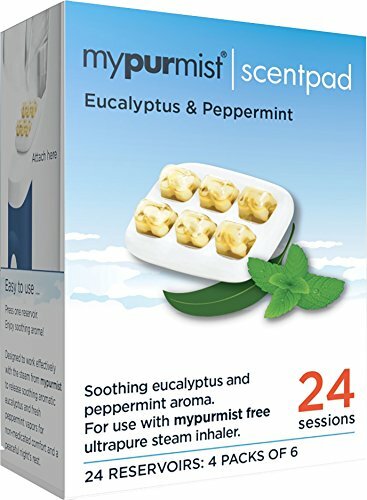 NEW ScentPad is designed to work effectively with the steam from cordless mypurmist free to release soothing aromatic Eucalyptus and fresh Peppermint vapors for non-medicated comfort and a peaceful night's rest. Steam delivers fast, natural relief from sinus congestion, colds and allergies. Each mypurmist ScentPad has 6 reservoirs of 100% natural essential oil that are uniquely designed to work with the steam from mypurmist free. 50% Eucalyptus, 50% Peppermint; Double distilled essential oils. Easy to use accessory with 6 essential oil reservoirs. One reservoir may be used multiple times in the course of a day. Sold in pack of 4. 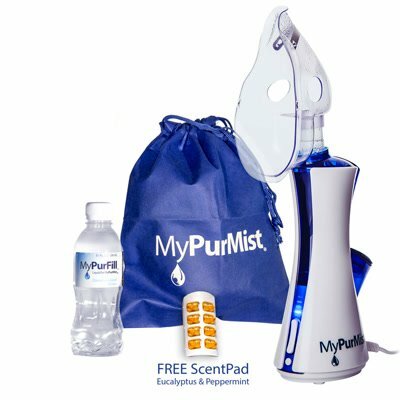 If you love essential oils and aromatherapy then mypurmist ScentPad is for you! NOTE: This ScentPad fits our Cordless MyPurMist Free Unit. 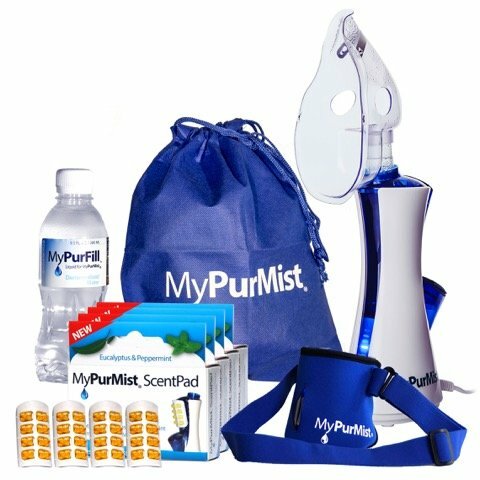 Please Use the MyPurMist 8 reservoir ScentPad for our plug-in MyPurMist unit....... Cordless mypurmist free ultrapure handheld steam inhaler is sold separately. Fast Natural Relief from Sinus Congestion, Colds, and Allergies. 100% drug-free therapy. 1 year warranty. Easy: Handheld, portable with Instant ON and no maintenance. Use anywhere, anytime. Doctor Recommended: Steam therapy is a natural decongestant widely recommended by leading medical institutions (e.g. Mayo Clinic, Harvard, Kaiser Permanente). 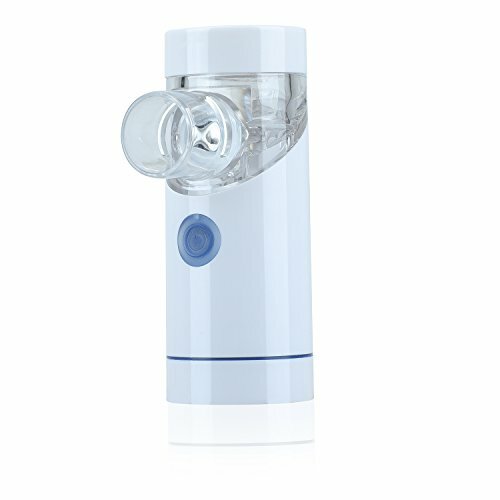 Advanced: Uses patented hospital technology to deliver germ-free steam with no boiling water for fast, natural drug-free relief. 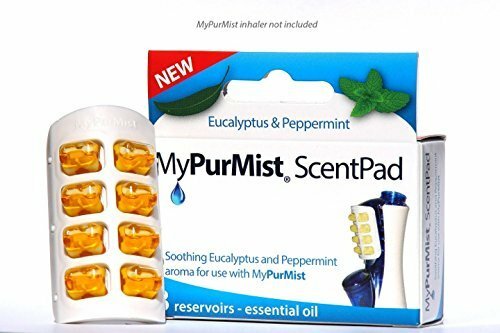 NEW MyPurMist ScentPad is designed to work effectively with the steam from MyPurMist to release soothing aromatic Eucalyptus and fresh Peppermint vapors for non-medicated comfort and a peaceful night's rest. Steam delivers fast, natural relief from sinus congestion, colds and allergies. Each MyPurMist ScentPad has 8 reservoirs of 100% natural essential oil that are uniquely designed to work with the steam from MyPurMist. 50% Eucalyptus, 50% Peppermint; Double distilled essential oils. Easy to use accessory with 8 essential oil reservoirs. One reservoir may be used multiple times in the course of a day. PLEASE NOTE: MyPurMist Steam Inhaler sold separately. Use your MyPurMist Handheld Steam Inhaler without having to hold it! 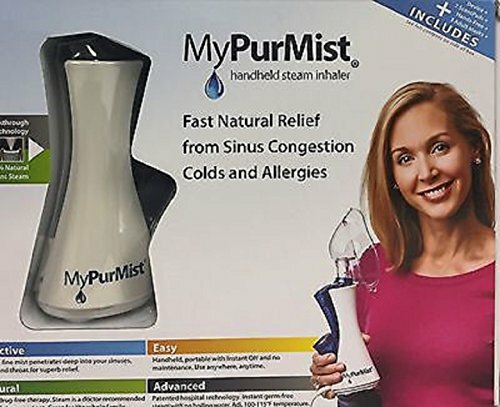 Keep both hands free, get the soothing benefit of MyPurMist while you continue working on your computer, holding a good book, or just for plain relaxing! This accessory includes an adjustable and elastic strap so that you are always comfortable - even when you move around! 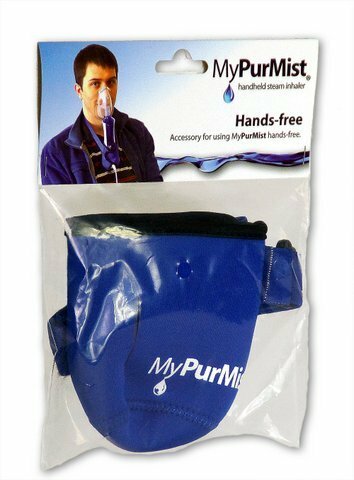 The MyPurMist Hands-Free holder is made from high quality neoprene and is latex-free. Wash by hand and air dry. If you love your MyPurMist Steam Inhaler, this is the MUST HAVE accessory for you! Uniclife idea product for families, used for the beauty. Besides skin care and used for interior humidifying in a powerful and efficient way.Any Problem with the Operation - Please consult our newly updated instruction manual and contact us. Cool mist,Comes on instantly,No waiting. Overall this item is in excellent condition it doesn't appear to have been used but we are unsure so we are marking it as used. All parts are included with this item. Effective: Instant fine mist penetrates deep into your sinuses, nose, and throat for superb relief. 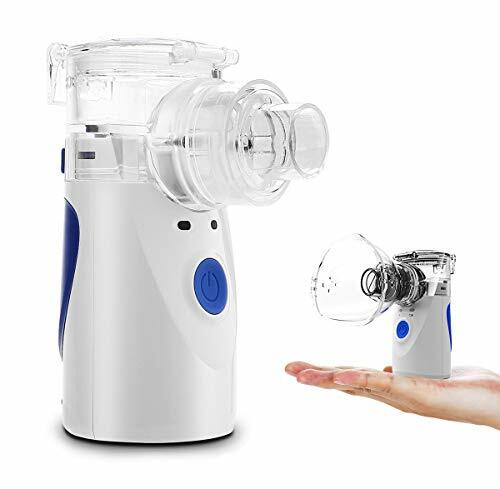 ♥[Portable Vaporizer]:Lightweight and Portable,one-button operation system, ontinuous working at various angles,product Size: high 10cm, diameter 4.5cm, weight only 100g can use anywhere and anytime. ♥[Easy and Quiet]: Silent Operation, virtually noiseless operation, noise level as low as 25 dB. ♥[Convenient]:Replaceable cup, detachable head for easy cleaning, it is suitable. 12 month warranty. 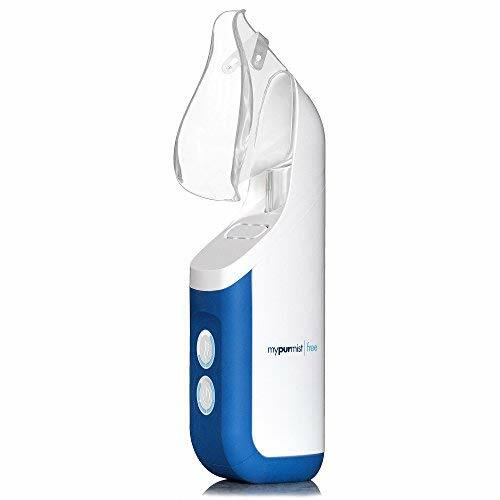 Use your mypurmist free cordless Handheld Steam Inhaler without having to hold it! 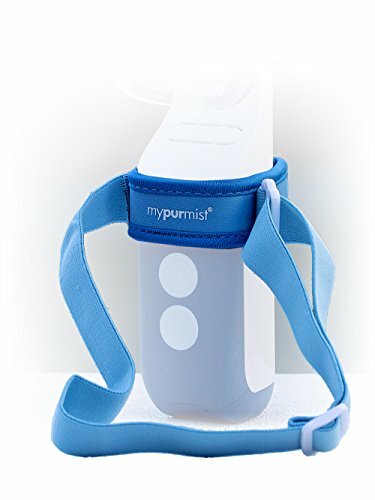 Keep both hands free, get the soothing benefit of mypurmist free inhaler while you continue working on your computer, doing household chores and enjoying outdoors! Made from high quality neoprene and is latex-free. Wash by hand and air dry. 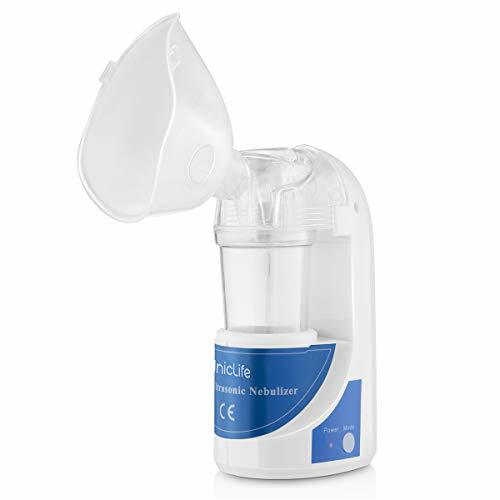 If you love your cordless mypurmist free steam inhaler, this is the MUST HAVE accessory for you! 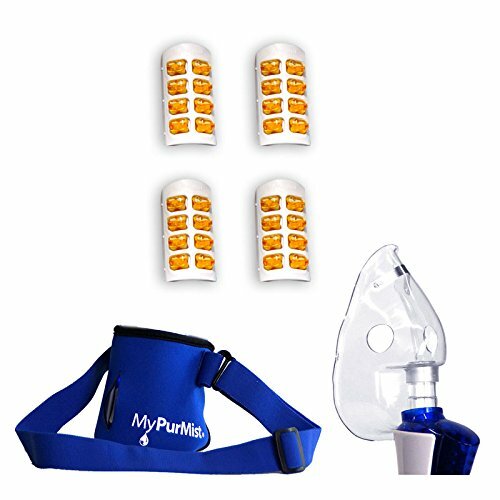 If you love your MyPurMist Steam Inhaler, these are the MUST HAVE accessories for you! Read safety information in user manual carefully before use.